Students, independent or amateur filmmakers and film collectives (also referred here as entrants) are encouraged to submit their works for selection and possible screening in the festival. Submission of entries is until June 15, 2012. • Works from varying categories: documentary, narrative, experimental, animation, motion graphics, music video, PSA, and other forms of audio-visual new media. • Works should be about the theme History and Social Change. • Works produced from year 2007 onwards. Works already submitted to the film festival during previous years need not be submitted again. • Works from Luzon, Visayas, Mindanao and Metro Manila. • Special attention will be given to works on children’s situation and participatory video/media production. • Works screened in other festivals or awarded prizes previously are accepted. • Works submitted must be produced or directed by individual or groups of Filipino descent. • DVD of the work. Video formats should be in AVI, MP4 or MOV. The DVD may also include the works’ trailer. There should be one DVD per work. A DVD copy of the work may also be included in the submission provided video formats stated earlier are also submitted. Works in other dialects (Waray, Bisaya, Hiligaynon, Ilokano, etc.) should have Tagalog and/or English subtitles. • For electronic copies, upload film and other requirements to any online file sharing site and send the download link. (b) they have the right to enter the work in the festival and allow its exhibition. • There is no registration fee. Entrants shoulder the cost of posting/sending their work. • Entrants may submit more than 1 work. • Submitted works will not be returned. Entrants are advised not to send their master copy. • Entrants reserve the rights and ownership to their work. • Works submitted become part of the collection of Pandayang Lino Brocka and shall be used continually to develop and popularize the program of the festival. • Entrants are automatically giving the rights to TUDLA Productions to screen their works submitted to the festival for public viewing in different venues. • Only entrants with selected works will be informed as to the selection of their work for the festival. • The decision of the festival’s selection committee is final and cannot be challenged. • Certificates for special citations (Viewer’s Choice, Jury’s Choice, Breakthrough Film and other awards from sponsoring organizations) will be awarded. No cash prize is offered to works selected for screening in the festival and their producers. • Entrants are open/willing to attend and invite audience to the screenings, workshops and the talks. For the workshops, they must reserve their slot. • Barring any unforeseen circumstances beyond the organizer’s control, the festival will be held on August 21-23. 2012. • Screenings are be free of charge. In some legs, organizers may request for a minimal amount as donation to cover overhead expenses. • Screenings in the schools and communities will hold a votation for the Viewers’ Choice Award special citation. • An open a forum for mass criticism of the works will be held during screenings in the indigent communities. • List of films to be screened in a particular venue shall be announced prior to the screening. Order of films and list of films are determined by the film fest secretariat and programmer from the partner/host organization of the screening venue. • Other screening dates in venues not previously covered by the festival may be added. 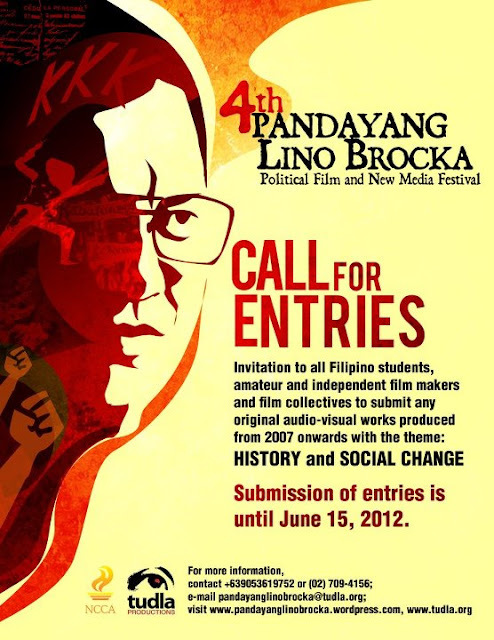 Submission of entries is until June 15, 2012.